Fairy-tale retelling alert! We all know how much I dig this genre, and this one was no disappointment. 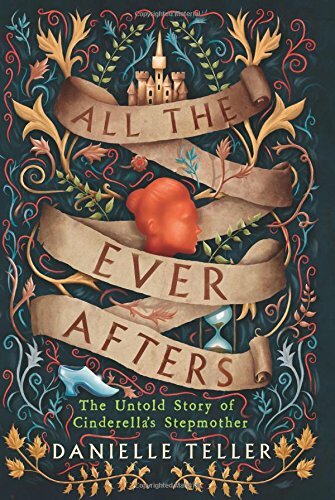 All the Ever Afters is a re-imagined tale of the classic Cinderella story whose main focus is Agnes, or as you may know her from the more well known version, the evil stepmother. Agnes is a young child when she is forced from her home into servitude as a laundresses apprentice after her mother dies and her father realizes he has too many mouths to feed. Young Agnes' life is hard, but through hard work, determination, and wit, she slowly works her way up the social ladder. Over the next two decades she learns to read and write, bears children, learns to brew ale, runs her own alehouse, and eventually becomes nursemaid to a young child, affectionately named Ella. When circumstance leads her to marry Ella's father (a nobleman), Agnes struggles to love this breathtaking (if daydreamy) beauty. Agnes beginnings as a servant make it nearly impossible to coddle the young child as everyone else seems to do, but nevertheless she raises her to the best of her ability. Ella and Agnes' relationship is strained at times, but weathers the storm of parental loss and teenage growing pains to transform into something whole and meaningful. I can't tell you guys how much I adored this book, not only was the story line perfect, but the writing was lyrical and captivating and art in and of itself. Part of the reason I really enjoy these types of retelling's is that the reader is privy to a deeper dive into characters lives that are otherwise left very one dimensional in the traditional versions. These secondary characters are made whole, given life experiences, and the reader gains insight into the reasoning behind decisions they made and the grim realities they have faced. Agnes was a superbly well written character. Her ingenuity and adaptability really highlighted how much of a survivor she was; in a time period where women were not afford options and possibilities, she really had to work within her circumstances to better her life. Using her wit and perseverance, Agnes was able to take the hard hands dealt to her and not only survive, but thrive. No matter how many times she was knocked down, she got back up, and got back up stronger. Seeing her relationship with Ella through this new lens really gave perspective into a different sort of reality. Not everything is so black and white, good and evil. Sometimes we are just different people, with different upbringings, and different world views struggling with relationships because we really just can't see where the fault lies (likely with us as much as with them). It shows just how much the baggage of our past can really impact our relationships if we let it, and that ultimately in the end, it can be overcame, if only we try. I thought Ella was a really unique interpretation of Cinderella. She came off as not just an entitled aristocrat but someone who also perhaps was on the autism spectrum; her fixation on dresses and linens, self soothing with organizing and repetition, difficulty relating to and forming relationships with others, and her constant desire to be in solitude/her own world. It was a really interesting take on the classic heroine and refreshing to read a different sort of character. Overall, highly recommend this one. It was an enchanting read that kept me enthralled from page one!